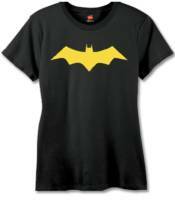 The Batgirl Symbol features a singlecolor imprint on a black 100% cotton tee. Whatever form it takes, the message is clear...Batgirl is here! NOW AVAILABLE for sale in Canada and U.K.